As well as our Son, Gabriel is also a grandson, a nephew, a cousin and a little friend to all of our close friends who journeyed with us through his time here. His imprints live in our hearts and all those whose lives he touched forever. 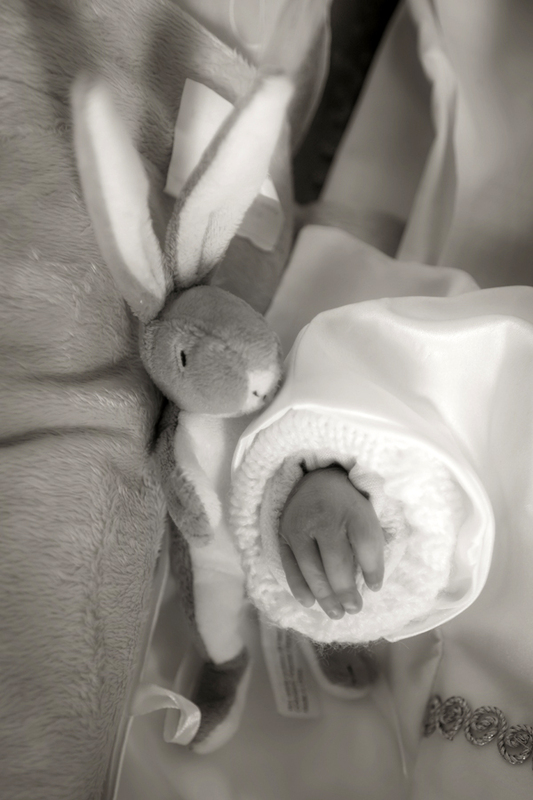 Our Son's Special journey began when we found I out I was expecting a little bundle of joy. We were over the moon. We shared our amazing news to our families Christmas Eve and Christmas Day. It was the most wonderful Christmas present ever. It was our first baby. We were in the middle of building our new home and I had just got a new job in a school nearer home. Life just couldn't have got any better and we felt so blessed. 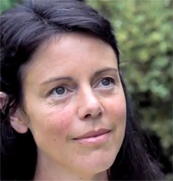 During my pregnancy I was lucky enough to have great health, I felt better than I ever felt. I had no morning sickness and I often joked about not understanding what all the hype about pregnancy sickness was about. At 12 weeks and as first time parents we were both anxious going to our first scan, but we were quickly reassured that the pregnancy was progressing very well. Our little boy had an extremely strong heartbeat. Our Consultant was really amused to see our baby's arms and legs moving so early. We were so excited and relieved and we joked that our baby was probably a live wire like both of us!! We danced out of the hospital full of the joys. Being naive, we assumed that once we had this 12 week scan over and all was well, we really believed and hoped that our baby would be born perfect and healthy. Our next scan at the hospital at 20 weeks lasted for a considerably long time. Although we were first time parents I just got a maternal instinct that something was wrong. Then I fobbed it off and put it to the back of my head and figured it was only me being a bit of a worrier. 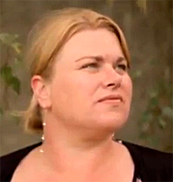 Our consultant could not get a detailed examination of our child’s vital organs. Our little boy was like a live wire and kept moving constantly. Our consultant found it difficult because of this to get accurate measurements. He asked us to return in two weeks. We returned to the hospital for another scan, it was on the evening of our 2nd Wedding Anniversary. At another very long scan our consultant explained that he was not getting the measurements that he needed - a measurement of the circumference of the brain and other crucial information about the heart but because our little boy was moving so much he was unable to get these details. We expected like any other parents to get great news at this scan, but we didn’t. It was almost like an empty vacuum for us we didn’t know what to think. So many things it could have been but yet we had no idea as to what was wrong with our child. We went for our meal as we had planned, to mark our anniversary although I spent most of the time crying and wasn’t able to enjoy it. We were told that our consultant was see us back for a scan in two weeks. In the mean-time we supported each other and remained calm and very positive. But our worst night-mare was about to unfold. On the way to our next scan, we got a call as we were approaching Castlebar. It was our consultant’s nurse making sure we were definitely coming. 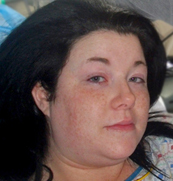 She explained that a special sonographer would be there with our consultant to carry out a thorough, detailed scan. Our hearts shattered. I could hardly breathe or think straight. On arriving to the waiting area, I heard my consultant say “She has arrived”. That evening our lives changed forever. We got the news that no couple should ever have to hear. After a long scan we were told that our baby had various types of abnormalities, a cyst on the brain and kidney and heart abnormalities. They explained that our baby may not survive outside the womb and it was due to a rare chromosomal disorder. Our world just shattered. It was so hard for us to try and even make sense of what they had just said. We thought our child might have some type of special need but to hear that our child may not survive outside the womb. It was just numbing. Fear, panic and worry took over for us. They spoke to us about the 3 main types of chromosomal conditions; Down’s Syndrome, Patau Syndrome and Edward’s Syndrome. Being the very hopeful and positive people we are, we just assumed that our baby would have Down Syndrome. I just thought no way can our baby have either of the other genetic disorders as they are so rare. I explained that I have a brother with Down’s Syndrome and that we would celebrate this, if our baby had Down’s Syndrome. Our consultant explained that we would be referred to Holles Street National Maternity Hospital straight away to see a specialist at the Fetal Medicine Unit. He explained that their scanning machines would give a much clearer picture. All this happened during my Easter Holidays from school. The next week was torture. We couldn’t eat, sleep or think about anything else other than our precious baby. My birthday was Easter Monday and that Tuesday we made the dreaded journey to Dublin, one we both will never forget. The following Wednesday morning we were met in the Fetal Med Unit by a lovely midwife called Barbara. She brought us to a private room and she carried out the 3D scan. She began explaining the problem that our little boy had shown during the 3D scan. She gave us some time on our own to take it all in. We just bawled crying and hugged. Neither of us were able to talk. Dr Peter McParland, Director of Ultrasound and Consultant Obstetrician and Gynaecologist at the National Maternity Hospital then came in, introduced himself to us and explained that he would carry out another extensive scan. As they did the scan, they mentioned all the terms we had come across online as we researched this. Our nightmare was confirmed. Professor McParland explained to us the difficulties our Son had. He said he was 99 % sure that our baby had Edward’s Syndrome and that it was highly unlikely that our little boy would survive outside the womb. He was a very compassionate person. He said to us that he hoped he had got it all wrong. We were offered the Amniocentesis test to determine this however we refused. We did not want to interfere in any way with our precious child. We had a special blood test done in Dublin. This Harmony blood test would determine if our Son had Edward’s Syndrome. These bloods had to be sent to the UK and so we would not receive them for two weeks . We walked out of Holles Street and we both cried and hugged. It’s almost like a blur. The world moved on, crowds passed us on the streets, but it felt like our world had just seized. Our world was crumbling around us. The heartbreak we both felt was just indescribable. We pulled in to Longford Cathedral on our journey home and we lit three candles something we often did. We prayed, hugged and cried together. Our journey home was almost in silence. Neither of us could take in the dreaded news that we had received. Up until this, we were trying our best to stay positive and we were still so full of hope. 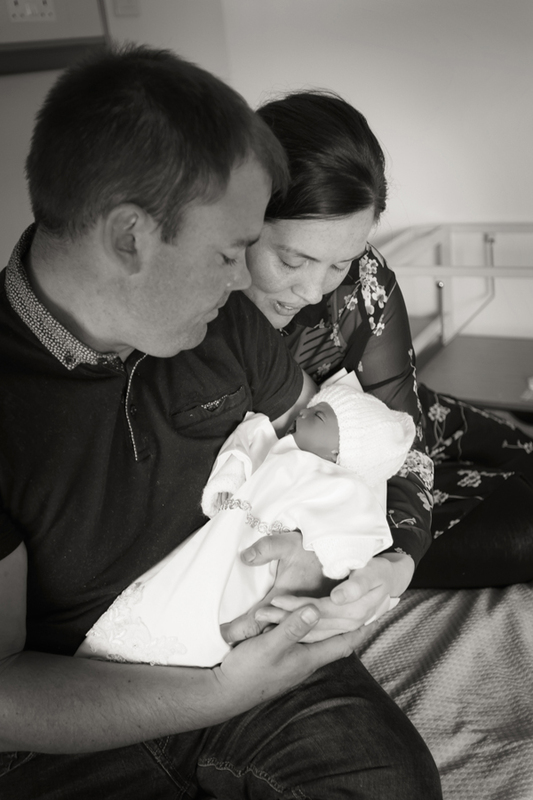 2 weeks later our Consultant met us and the blood test confirmed that our baby had an extra chromosome, Trisomy 18, a rare genetic condition known as Edward’s Syndrome. We embraced his life together the 3 of us. For many weeks now, we followed our usual bedtime routine, we read our little boy 'Bedtime Stories', we cuddled in and sang to our baby, we prayed together. We were utterly devastated and heartbroken. Our world was continuing to crumble.We were to prepare for our Son’s birth and we could not wait to meet him, yet they told us that he may not survive outside the womb. 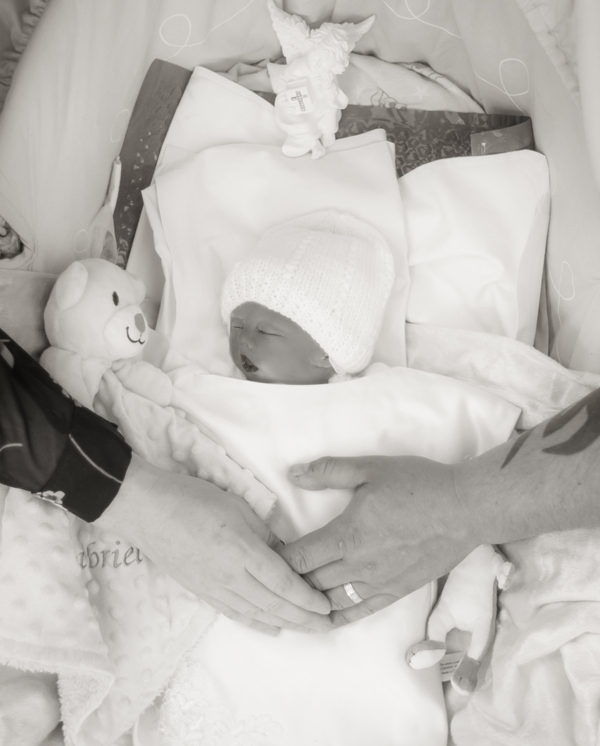 In the midst of our heartbreak and fear we had to celebrate every second we carried our little boy, but at the same time we had to prepare for the unbearable and unthinkable, that his life on earth might be very short. Suddenly for us feelings of grief and yet joy were coming together. These two types of emotion should not have been coming together and this was extremely hard to deal with. I contacted anyone I could for support. Féileacáin and Soft Ireland were incredible. At the end of the phone they helped us and guided us, advising me to make as many memories as we could. 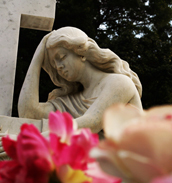 I also met with a Bereavement Counsellor in Castlebar and he proved invaluable to me on this special journey. Our faith, prayer, support and love for each other and the love and support of our amazing families and friends helped us to get through some very dark days. 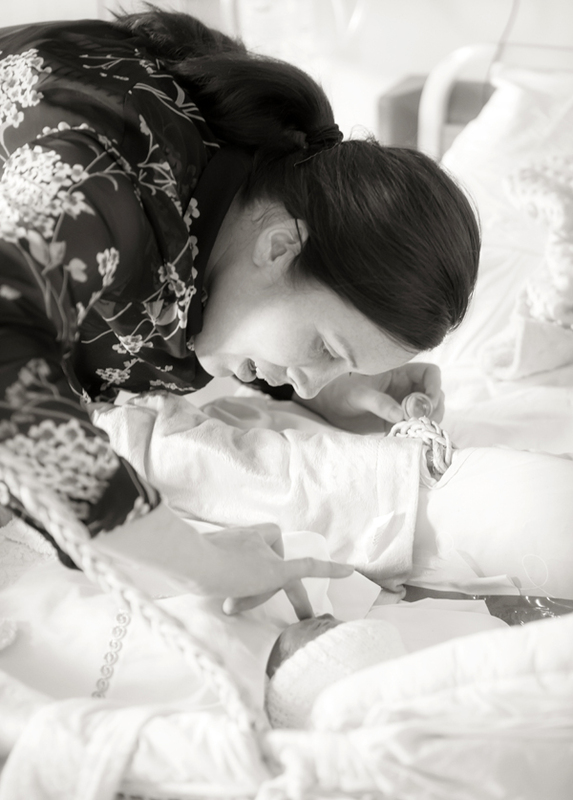 My husband and I began this journey with a mindset that we would treasure every bit of time we had with our Son, no matter how short his life would be. We cherished every day I carried Gabriel. He was always kicking and moving about. 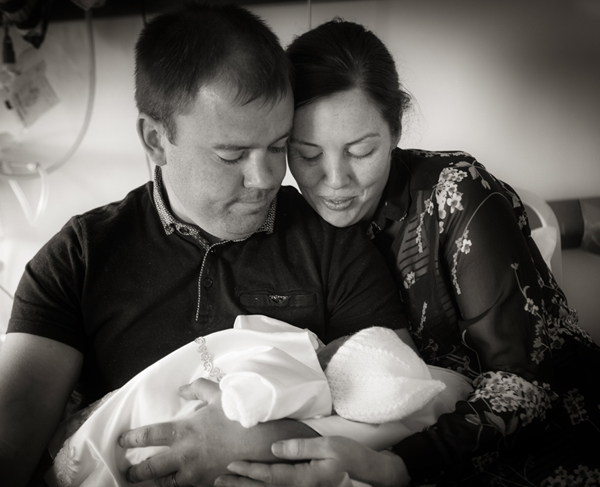 It felt like he gave us the kick we needed to say “Come on Mammy and Daddy, let’s make the most of my little life”. He was constantly fluttering around, growing and getting stronger and this was a constant reminder to us to be strong and celebrate the here and now. And that is what we did. We embraced his life together the 3 of us. For many weeks now, we followed our usual bedtime routine, we read our little boy ‘Bedtime Stories’, we cuddled in and sang to our baby, we prayed together. That was the time Gabriel Alex was most active, when he was cuddled up with us, the 3 of us woven together. Every night, to end our bedtime routine, his Daddy would kiss my tummy and whisper words of love to his Son. Every day, I would wrap my arms around my tummy and cuddle Gabriel. I would tell him a few times a day, each and every day how much we both loved and adored him.We started to especially plan our weekends as we wanted to take our son to as many special places as we could and make every second of his short life count. We carried our Son with us on many adventures and days out together as a family. We visited many places with our little boy; Croagh Patrick, Céide Fields, Ashford Castle, Down Patrick Head, Knock Shrine, Keem beach, as well as many other beaches, long walks on the Greenway, not to mention the amount of Mayo matches!!!! Gabriel Alex was definitely Mayo’s biggest fan, he used to kick like a live wire in the midst of the excitement. We recorded many clips on our camcorder and every Saturday we celebrated Gabriel Alex reaching another weekly milestone. 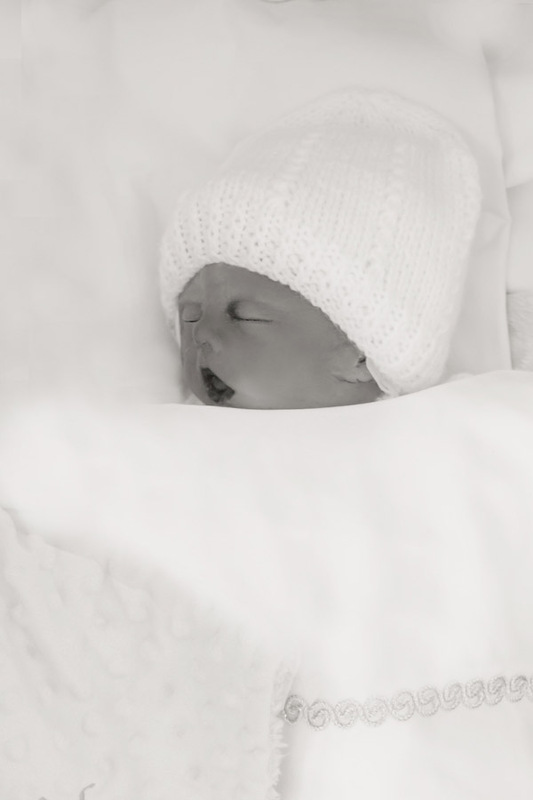 At 30 weeks, my consultant told me that I had a huge amount of amniotic fluid and so I could go into labour any time. From 34 weeks Gabriel’s head was in position, but we knew he was far too cosy and our little man wouldn’t arrive sooner than his due date. I always took great comfort knowing that my Son was happy and snug inside me. We were also told that our little boy could fall asleep anytime as his heart was not formed correctly. I was told from very early if I ever felt no movement come straight over to the maternity ward. Our little hero defied all the odds. He wasn’t giving up and nor were we his parents. We continued in the middle of all this to beg God for a miracle but at the same time we always said we would accept the plan he had for us. We still remained hopeful and prayed that all the Medical experts had got this all wrong. So we went home and were surrounded by our families who showed us great love, strength and support at the most difficult time anyone could imagine. They too were heartbroken and as we embraced each other, the tears flowed as our hopes and our dreams for our little boy were taken from us. We were blessed to have an amazing consultant with us throughout the journey. His heart was broken for us. He was so compassionate and caring, I knew he loved our baby too and would do everything he could for us. As it happened, he was due to go overseas, on a trip but he even joked to me one time saying that no matter where he was in the world he would fly home just to be with us if I went into labour. 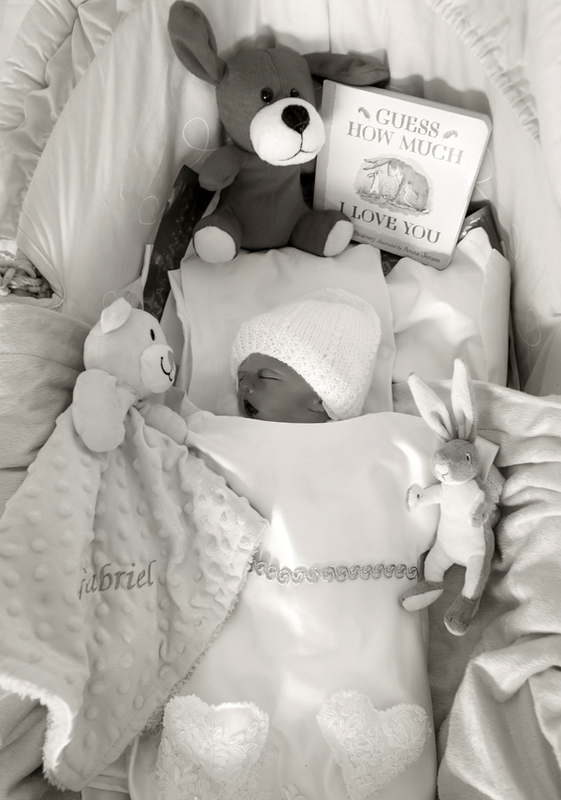 I was always treated with such care and compassion; it was clear that to him our precious little boy Gabriel Alex was just as important as any other baby. 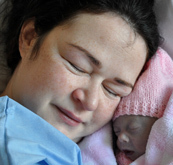 We cannot speak highly enough of our consultant, the Perinatal Hospice nurses, particularly Frances and all the staff at the Maternity Unit in Mayo General. They do their job with the greatest love in their hearts. Every Tuesday, we had our scan and everyone at the hospital was so thrilled each week that Gabriel Alex had reached another weekly milestone. Every week we celebrated having another week to cherish with our Son. Every Tuesday, we went to Bar One Restaurant after the hospital. Our little man like his Mammy and Daddy loved good food. The minute it touched my lips I would feel Gabriel fluttering. Having now reached week 40 of our journey together safely, on one level, we were elated as we had surpassed all the dreaded milestones set out before us, but on another level we knew our time was getting shorter and the heartache was becoming unbearable. We loved having our son here, we knew where he was, that he was loved, safe and snug, the thought of ever having to depart from him filled us with panic, dread and despair. Even on the very last Tuesday before Gabriel was born, after the scan I said to Eamonn ‘I don’t really feel like going for dinner”. Just then, as my Husband turned to me and asked ‘I wonder does Gabriel want to go for dinner?’ That very second I got a huge kick! We smiled and thought “Well that answers that!’ as we strolled along, the 3 of us, in the direction of Bar One. However, after dessert that evening, I got the last big kick that I was ever going to get again from our little boy. The next day, Wednesday, I felt no movement at all. I ate some jellies, had a coffee, drank ice cold water, relaxed, meditated, prayed and sang to our little pet but there was no movement. We delayed as much as we could hoping to get even a tiny flutter. I rang the Maternity Ward and was told to come over when we were ready. We arrived over at 7pm that evening, completely terrified and heartbroken. We were taken straight into a delivery suite and our consultant was called. He advised the midwife to put on the doppler to check for a heartbeat. 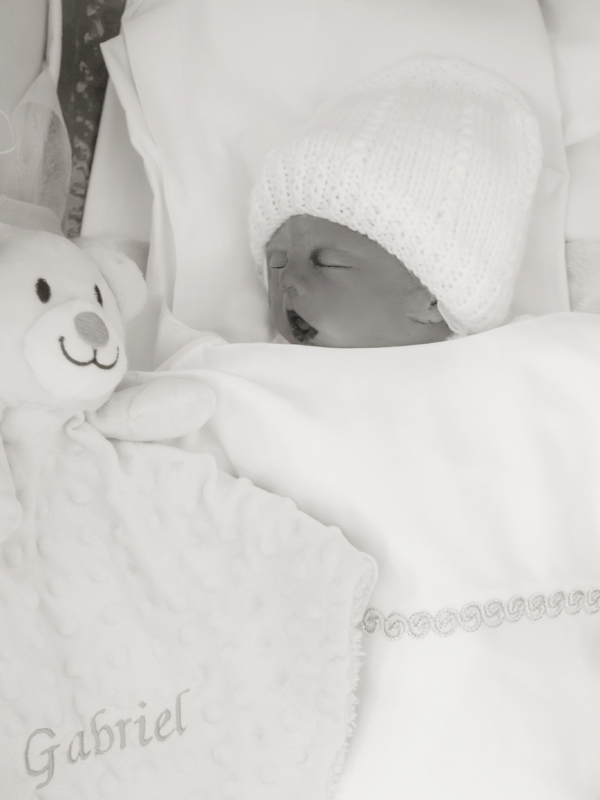 To our amazement, as soon as the midwife put the monitor on my tummy we could hear the loud noise and our Son’s little heartbeat was like a galloping horse. It was as strong as it ever was. I cannot explain the relief in our hearts driving home that evening.The following day, Thursday I had no movement but I had a feeling that our Son was fine. I decided I would get his heartbeat checked Friday morning at our GP as I just couldn’t face going back to the hospital. It is a day we will never forget. It was the darkest, gloomiest morning we had ever witnessed in July with torrential rain pouring down. It was like the weather felt our pain. Our GP put on the heart monitor. The deafening silence was enough. She listened and listened only getting one heartbeat. Our next step was to the Maternity Unit. As soon as we got there our consultant was called and he began to scan me in the Assessment Unit. We were hoping against hope. I couldn’t look at the screen. Our consultant stared at the screen in silence and I just said squeezing Eamonn’s hand very tightly “He has left us, hasn’t he?” He answered heartbrokenly “ Yes, he has”. Our hearts shattered and our tears flowed and we cried and cried. The pain we felt was unbearable. Our consultant explained to us that at this stage, if I didn’t go naturally into labour myself I would be induced at 6.30 am that Sunday morning. So we went home and were surrounded by our families who showed us great love,strength and support at the most difficult time anyone could imagine. They too were heartbroken and as we embraced each other, the tears flowed as our hopes and our dreams for our little boy were taken from us. That Saturday morning at 4 am my waters broke. I thanked Gabriel with all my heart as I knew now that things would just progress naturally and Gabriel knows that was always my wish. The minute we arrived at the hospital we were treated with such deep love and compassion. Our little Angel was born sleeping on his birth date on Saturday 22nd July at 5.22pm. I will never forget that moment when Gabriel Alex was placed in my arms. It felt like my heart was going to burst with love and pride. I kissed him dearly. It was all worth it . Our baby was here with us in our arms and we cuddled together as a family bonded with love. He was just beautiful and I honestly think he was the prettiest little boy I have ever seen.With almost angelic soft skin, he had his Mammy’s nose and lips and his Daddy’s eyes and dark hair.As we dressed him in blue clothing and placed his little hat on his head which read “A Star is Born”, although our hearts were shattered there was a love in our hearts radiating out. That love will remain in our hearts forever. Our little hero had fought his little fight right to the end. He, just like us, never gave up. He was a little miracle himself to survive his 40 weeks. He never suffered any pain and knew nothing but sheer love and pure happiness. Although his life was very, very short, we feel really proud as his parents to have made sure that his short life was lived and enjoyed to the full. Our Son got to experience so so much love and happiness as well as many adventures, bedtime stories, songs, dances, hugs, cuddles and lots of kisses as he was cuddled up cosy in my tummy. That evening we had a very special Christening Ceremony with the priest and his Grandparents. Gabriel Alex also got to meet his aunts, uncles and cousins who loved and adored him very much. We got the most amazing photographs taken professionally of the three of us the next morning by the special Charity called Now I lay Me Down To Sleep. Although at the time this was the last thing we felt like doing, these photos are invaluable to us and we cherish them each and every day. 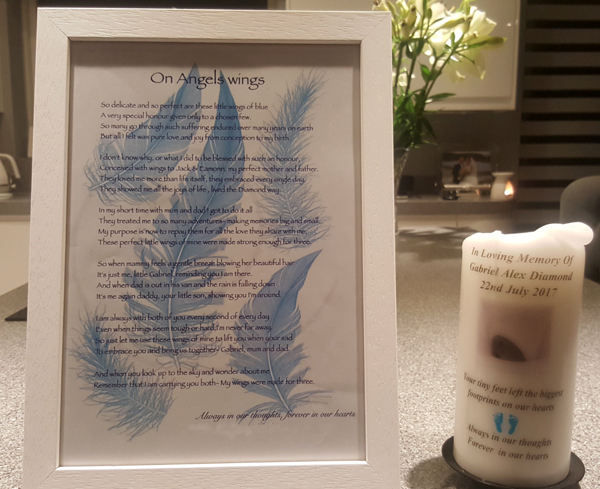 That Sunday morning we left the hospital broken, a feeling that no parent should ever have to feel on leaving the Maternity Ward, with his Daddy carrying our little angel home in his Moses basket, with holes in our hearts that will never be filled. We brought our Son home and surrounded by our families with their love and support, which really helped us to get through those dark, difficult days. Our Local Parish Priest was a great support to us. He prayed over Gabriel many times during our journey, he visited us over the past few weeks and helped us prepare for Gabriel’s final journey. He was a great friend and support to us the whole way through our journey. That Sunday night we did as we always did and followed our usual bedtime routine, with Gabriel beside us in the bed, we read his books ‘Guess How Much We Love You?’, ‘Adam’s Cloud and ‘Before You Sleep’. We sang his 3 little songs ‘Twinkle Twinkle’, ‘Barney Song I love You’ and ‘You Our Sunshine’. It was very difficult but holding our Son’s little hand, he helped us to do it. The next day, the sun was splitting the stones, it was one of the hottest days that came, yet our hearts were completely in pieces. Having said that, we decided that we were going to make an effort to look as best we could, so we put on our finest clothes just so we would do our Son proud and give him the send off on his final journey that he deserved. Before leaving the church that day, we took the most beautiful family photos and we will cherish these every day for the rest of our lives. 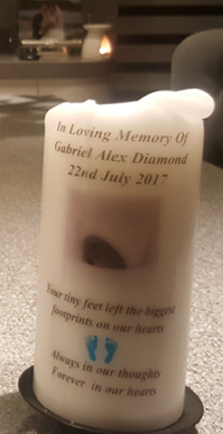 Lots of little treasures were sent with Gabriel on his final journey to heaven. He was spoilt with many special gifts and presents from all of his loved ones throughout his short life. In his little hand, we placed a blue rosary beads from Medjugorje , this was really special because it was given to his baby cousins when they were born, his blue teddy with his name on it that we cuddled into every night, his little Baby Bear Character from his book ‘Guess How Much I Love You?’, a red Man United teddy as we figured he definitely would have been a big fan (just like his Daddy! ), three special coins brought from the Vatican in Rome (a coin for each of us with a special prayer and symbol on each, so we wanted Gabriel to have ours as well as his own), a little Mayo football kit signed by Cillian O Connor and Keith Higgins with a special message to “To Gabriel, With Love”. 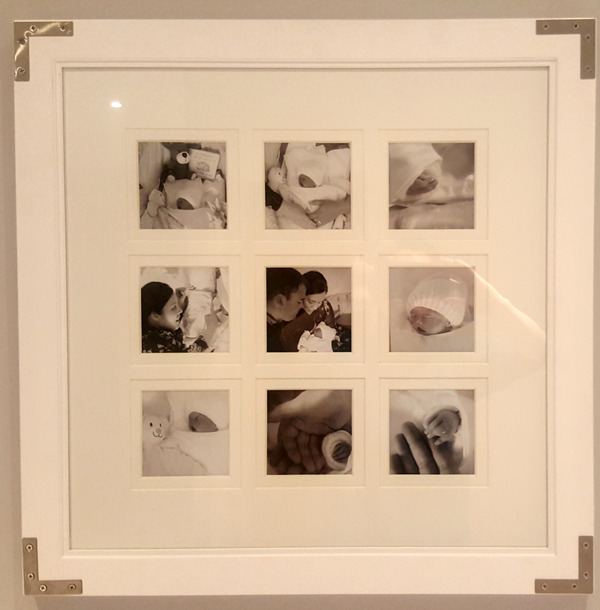 He received two kits, so we also have one of these framed and it will take pride of place in Gabriel ‘s room. Gabriel also had a beautiful white little embroidered heart placed either side of him, one from me and one from his Daddy, a special silver cross from Medjugorje that we used every night when we prayed together and a wedding photo of us, his Mammy and Daddy, to symbolise that the three of us will always be together. We would have loved to have kept all of Gabriel’s little treasures, but we figured we couldn’t be selfish. These all belonged to our little boy and they had to be with him on his journey to Heaven. Having to say our Final Farewell was the hardest thing we will ever do in this life. We just wanted to keep him here forever. There are no words to describe the pain we felt in our hearts. We celebrated our Son’s very short life with Mass of the Angels and we gave our little pet the send-off of a King, just as he deserved. Father Tod commented in his beautiful tribute to Gabriel with great emotion that he felt like he knew Gabriel well, as he had been a part of his journey. The day after the funeral our Priest did the Camino Pilgrimage and he often remembered our Son on this. On his return he called to visit us and had brought back a medal for us, a keepsake in memory of Gabriel on the Camino. He gave us great strength and support the whole way through. One thing we have learnt on this special journey is that “Love Truly Conquers All”. The pain we have suffered and will continue to suffer is worth it for the deep sense of love that we hold in our hearts. Gabriel Alex, you have given us the gift of parenthood and we are so grateful and proud to be chosen as your Special Parents. You have taught us a love we had never known before you entered the world. As well as our Son, Gabriel is also a grandson, a nephew, a cousin and a little friend to all of our close friends who journeyed with us through his time here. His imprints live in our hearts and all those whose lives he touched forever. You like many other special angels have shown the world that no matter how small or how limited your time on earth is, you can leave an impact that can last forever. You have shown that every life no matter how short is so so valuable and should be cherished and protected. As One, we go forward together, deeply touched and thankful for our Son’s short but extremely touching and special life. You are forever our Angel in Heaven. Your tiny feet have made the Biggest Footprints in our Hearts. We will hold you in our Hearts Gabriel Alex, until we hold you in Heaven.